My absolute favourite time to go is end of end of May/beginning of June—why? 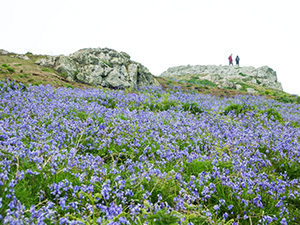 The Bluebells are out-the island is covered in a carpet of Bluebells, as you approach the island, it is blue! Above the bluebells float the Red campions and then floating through that is the white flowers, known as Danish Scurvygrass (what a name!) and then if the island isn’t already so magical, there are around 30,000 puffins!! When you go at this time, you won’t see the well photographed sight of puffins flying in with sand eels in their mouths, as the eggs haven’t hatched yet. This is why I say you should go twice, and maybe even thrice! 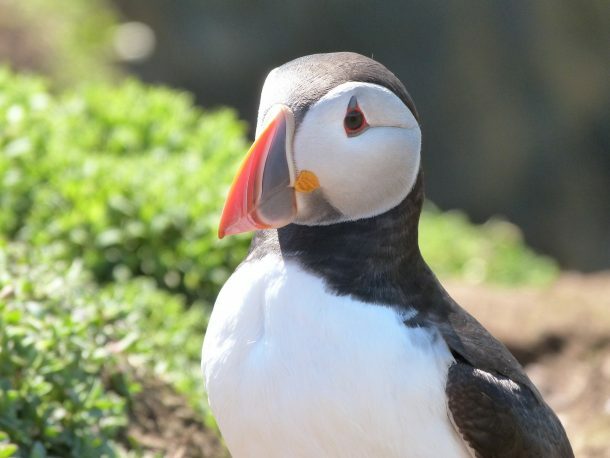 The second time to go is from end of June, the ‘pufflings’ (baby puffins) have hatched now, and this is when you can get your iconic shot of the puffin flying in with the sand eels in their mouths. The third time to go is beginning of July, as the pufflings now start to come out of their burrows to stretch their wings in preparation for fledging. Cute little balls of fluff, all shades of grey, black and white!